During the 1930s, a series of short informal histories of the various Middleborough school houses were compiled by J. Stearns Cushing, Superintendent of Middleborough Schools from 1927 until 1955. Mr. Cushing prepared these histories for publication as a series in the Middleboro Gazette beginning on February 24, 1933. With information culled largely from town reports, the series entitled "The History of Our Schools" sought to provide the community with a better understanding of the past history of its public school buildings. 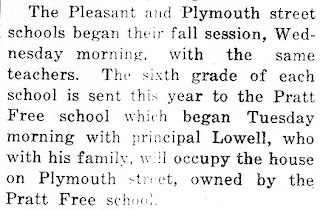 Like Cushing's history of the Pleasant Street School, his coverage of the Plymouth Street School is brief and is here supplemented by additional background on its history. The Plymouth Street School was built in 1903 to replace an earlier school building which was described in the 1901 School Committee report as being in poor condition. At the time, the school house on Pleasant Street was also in need of replacement, and the idea of unifying the two into a single district was pressed: "The consolidation of both schools at North Middleboro, the Pleasant street and Plymouth street schools, into a new two room building would give to the citizens of that section of the town better graded and more efficient schools. The need of better accommodations is imperative. The question as to whether it would be better to erect new buildings on the lots now occupied by the old, or to erect a new two-room building at some central point, from an educational point of view, can have but one answer, and that is the last proposition should be carried out. With a two-room building the primary grade would occupy one room and the intermediate the other, while the upper grades as now would enter the Pratt Free School. News item, Middleboro Gazette, September 6, 1918. Pleasant Street were typically noted in the local newspaper. ﻿﻿ Contrary to the recommendation of the Committee, a decision was made to build separate schools, with Pleasant Street receiving priority, and a building committee for that school being named in 1902. Despite its prioritization of Pleasant Street, the School Committee still believed "the school building at Plymouth street is in very poor condition and should be replaced with a new one, or the old one should be thoroughly repaired." Superintendent of Schools Charles H. Bates emphasized: "Attention is called to the condition at Plymouth Street .... Plymouth Street building is badly out of repair." Accordingly, Article 23 for the Annual Town Meeting was drafted: "To see if the town will build a new schoolhouse at North Middleborough on Plymouth Street, raise and appropriate money for the same, and act thereon. (On petition of Warren S. Gibbs and fifteen others).)" The article was approved and a building committee consisting of David G. Pratt, William C. Litchfield, and Chester E. Weston was named. 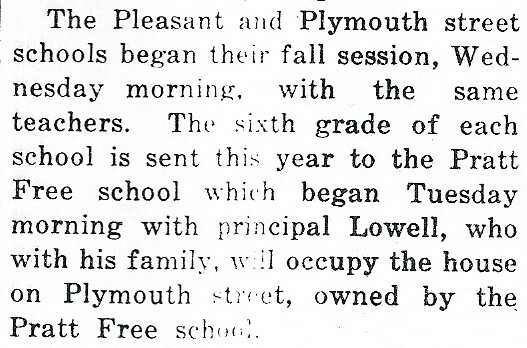 The new Plymouth Street School was a one-room schoolhouse capable of accommodating 30 pupils. $2,500 was appropriated by the town, and $25 was received for the sale of the old building. The school was designed by architect Eugene L. Clark (for $75) and built by Frank E. Pierce at a cost of $1,525, the total cost of constructing and furnishing the school, including a fence, being $2,468.31. The present Plymouth Street building was built during the summer of 1903 the appropriation for the same having been made at the annual meeting of that year. For many years previous to that date the Committee had repeatedly recommended a new building there, but only necessary repairs had been made from year to year. The report of 1904 states: "The new building for which an appropriation was made at the annual meeting in March was finished and ready for occupancy at the opening of school in September. It is similar in design to the one at Pleasant Street, excepting it has no basement and the furnace room is in the front part of the building. It is well lighted, heated and ventilated, equipped with modern furniture and in every way an attractive modern suburban school building. At the dedication exercises in November, a pleasing feature was the presentation to the school of an organ by Hon. David G. Pratt, a member of the building committee. A well has been driven, which gives a good supply of pure water." The building at the time of its erection contained all nine grades and a total of 24 pupils. At the present time the house serves only the first three grades of the children in that section of the town. As had been the case with the Pleasant Street School, continuing rationalization of the Middleborough school system and consequent re-grading eventually reduced the number of grades housed in the Plymouth Street School, and during much of the period from the 1950s through 1983 it was the home to North Middleborough's first graders. At the start of the 1983-84 school year, the lower elementary grades at North Middleborough were consolidated at the Pratt Free School, and the morning kindergarten sessions conducted at Plymouth Street. In 1990, financial considerations closed the remaining suburban schools, including the Plymouth Street School. It was since sol by the Town of Middleborough and has been remodelled into a private residence. Cushing, J. Stearns. "The History of Our Schools: Forest Street School". Photostatic copy of original manuscript, 1932-33. Author's collection. Plymouth County Registry of Deeds, Book 1920, Page 424.